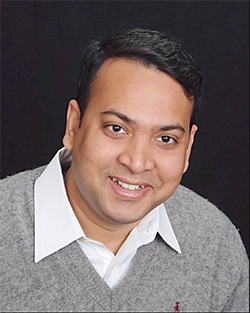 Dr. Dipankar Koley joined the department of chemistry as an assistant professor in September 2013. Dr. Koley obtained his PhD in chemistry from the University of Texas at Austin in 2011 under the guidance of Dr. Allen J Bard. Later, Dr. Koley moved to University of Michigan as a post-doctoral fellow to work under Dr. Mark E Meyerhoff. His research interest lies at the intersection of electrochemistry, biology and bioengineering. In OSU, Dr. Koley and his team will be working on developing new electrochemical techniques such as Scanning Electrochemical Microscopy (SECM) to understand the microbial metabolic exchange in biofilm at high spatial and temporal resolution.